Moghrey mie, Budget Magic lovers, it's that time once again! Lately we've been playing a lot of Standard on Budget Magic since the format is fresh, new and fun, which means we're overdue for some sweet Modern action. As such, today we're heading to Modern to play a deck that's cheap even by Budget Magic Standards at under $70 in paper and only 8 tix on Magic Online: Artifact Blast Affinity! The deck is basically an ultra-budget build mono-red Affinity deck, but rather than finishing the game with just creatures we have Shrapnel Blast and Galvanic Blast to take huge chunks of life from our opponent for just one or two mana at instant speed! Thanks to our blasts, if we can get in somewhere around 10 points of damage with our creatures our burn spells should be able to take care of the rest. Just how good is an ultra-budget, burn-heavy build of Affinity in Modern? Let's get to the videos and find out; then, we'll talk more about the deck! Artifact Blast is basically an a burn-heavy, ultra-budget mono-red Affinity deck. The basic plan of the deck is simple: we try to get in somewhere around 10 points of damage in the early game with our cheap creatures and then use our blasts—Shrapnel Blast and Galvanic Blast—to burn our opponent out of the game! 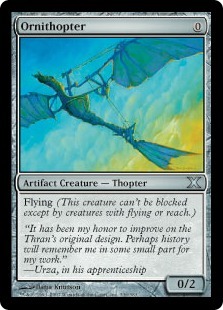 We kick things off with two free threats: Memnite and Ornithopter. While neither of these creatures is all that powerful, our deck mostly just wants as many artifacts on the battlefield as possible, and having some free options helps us flood the board quickly. Plus, both are fine options for wearing equipment like Ghostfire Blade or Cranial Plating, and they also combine with Springleaf Drum to produce extra mana for free! Next up on our artifact creatures list are the start of our one-drops, in Arcbound Worker and Vault Skirge. 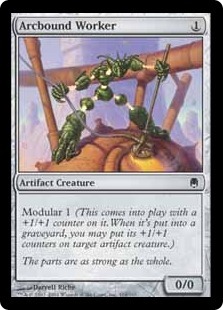 Arcbound Worker gives us another cheap artifact creature with the upside of being able to put a +1/+1 counter on one of our other creatures when it dies. Meanwhile, Vault Skirge—which is technically two mana, but we almost always cast it for one mana and two life, since we aren't playing any black-producing lands—is not only evasive but also has lifelink, making it one of our better creatures to buff with equipment. 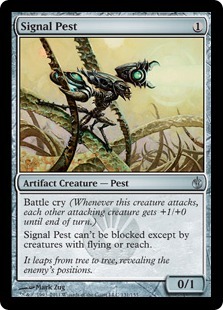 Signal Pest is one of our most powerful creatures. Its pseudo-flying ability makes it solid with Ghostfire Blade and Cranial Plating, and pumping our team when it attacks allows us to get in big chunks of damage with our cheap artifact creatures. 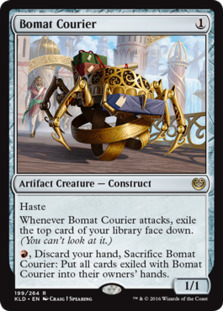 Meanwhile, Bomat Courier is one of the best cards in our deck. Since all of the cards in our deck are incredibly cheap, it's pretty easy for us to dump our hand in the early turns of the game, and then we can (hopefully) use Bomat Courier as a way to refill out hand and find just a bit more action to close out the game. While not technically a creature, it's worth mentioning Blinkmoth Nexus here as well. One of the upsides of being primarily colorless is that our deck has a lot of room to play colorless lands. Blinkmoth Nexus is the best of the bunch, giving us an artifact creature that survives sweepers like Pyroclasm and Anger of the Gods, since it's often hiding in land form. Then, when we are looking to close out the game, we can activate it to have another evasive artifact attacker to push through additional damage. If you look at our creatures as a whole, they admittedly aren't all that powerful. The important thing is that they are all artifacts. Our deck isn't really looking to kill our opponent with creatures in most games. Instead, it's looking to get in some early damage with our creatures and then close things out with a handful of powerful artifact-based payoffs! 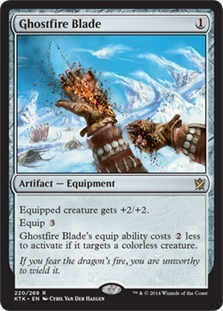 The first reason our deck is overflowing with cheap artifact creatures is that we have two equipment that care about having artifacts on the battlefield: Cranial Plating and Ghostfire Blade. 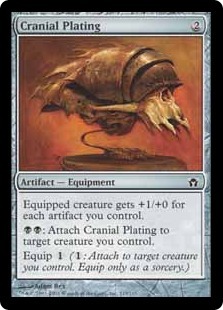 Cranial Plating is a staple in Affinity-style decks and perhaps the most powerful card in our entire deck, often giving the creature it's equipped to five or more power, which is especially scary with evasive creatures like Vault Skirge, Ornithopter, and Signal Pest. While our lack of black mana means we can't really move it around at instant speed with the "attach" ability, for the most part, that's fine—we simply equip it to a flier pre-combat and beat our opponent down. Meanwhile, Ghostfire Blade is sort of a backup Cranial Plating. While it doesn't offer the one-hit-kill potential of our other equipment, at just one mana to cast and one more to equip (since nearly all of our creatures are colorless), giving a creature +2/+2 is a pretty good deal for the cost. 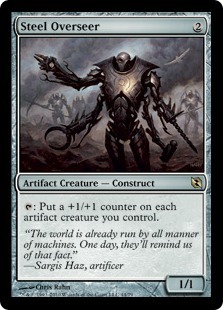 Thanks to all of our cheap or even free artifact creatures, there's a pretty good chance that we are attacking with a massive equipment-wearing threat as early as Turn 2 or 3! The most unique aspect of our deck is the eight blasts, with four Galvanic Blast and four Shrapnel Blast. Both cards offer extremely high amounts of damage for their mana costs but don't see all that much play, since they need to be in a dedicated artifact deck to work, with Galvanic Blast needing three artifacts to not be a Shock and Shrapnel Blast requiring us to sacrifice an artifact to cast it. This being said, since our deck is overloaded with artifacts, we shouldn't have much trouble casting them for full value. The main plan with these cards is simple: we look to get in somewhere around 10 damage with our artifact creatures and equipment and then trust that Shrapnel Blast and Galvanic Blast will be able to close out the game for just a few mana at instant speed! This means that even if our opponent finds a sweeper or a Stony Silence to deal with our artifacts, we will still have a way of winning the game. Since all of our creatures are so cheap, it's pretty easy to get in a handful of damage over the first few turns of the game, and then the blasts take care of the rest. With two blasts, we're dealing at least eight damage, and with three, things get even more absurd as they represent somewhere between 12 and 15 damage, which is almost always enough to finish the game! Since our deck is so cheap, we only play 17 lands, and nearly half of them are (or can be) artifacts to support our blasts and Cranial Plating. 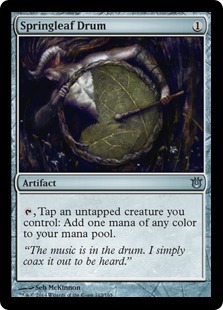 Springleaf Drum sort of works like an additional land since we usually have a Memnite or Ornithopter to tap for mana, but it's a land that we can later sacrifice to Shrapnel Blast to help close out the game. 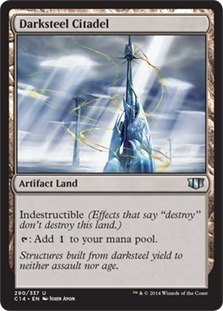 Meanwhile, Darksteel Citadel adds an artifact to the battlefield from the land slot to support our artifacts-matter cards, and since the only real colored cards in our main deck are Shrapnel Blast and Galvanic Blast, our deck can easily support a bunch of colorless lands. Having lands that incidentally power the main theme of our deck is one of the biggest upsides of Artifact Blast Affinity. Since we need to have lands in our deck to cast our spells anyway, cards like Darksteel Citadel and Blinkmoth Nexus are essentially free ways to up the power of our deck. Artifact Blast Affinity was pretty great. We played five matches and won all five, which is about as good as it gets, especially for a $70 deck in Modern. This was one of those rare cases where the deck played out almost exactly like we planned on paper, with our cheap creatures and equipment getting in enough damage to get our opponents in blast range, and then the blasts themselves finishing the job. 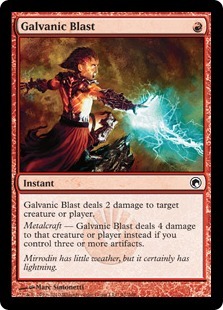 The fact that both Galvanic Blast and Shrapnel Blast are instants was hugely important to our deck, especially against control, where we were able to wait until our opponent tapped out and then finish our opponent off with massive chunks of damage. As far as changes I'd make to the deck now that we've played some matches, I'm pretty happy with the list in general, especially for being close to ultra-budget. Vault Skirge is a bit of a nonbo with Ghostfire Blade since it technically isn't colorless, but even with this downside, the combo of lifelink and flying makes it worth a slot in our deck. Otherwise, most of the cards I considered for the build (like Steel Overseer) are tough sells under the budget. All in all, Artifact Blast Affinity was quite solid and seems like one of the stronger budget options in Modern, especially for its price tag. 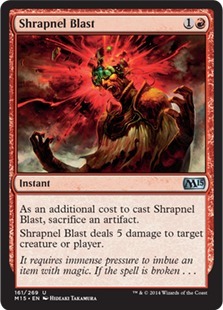 Having Shrapnel Blast and Galvanic Blast lets us beat Stony Silence naturally—one of the most devastating hate cards for Affinity decks—and even provides some protection from sweepers like Anger of the Gods and Pyroclasm, which is a huge upside to Artifact Blast. 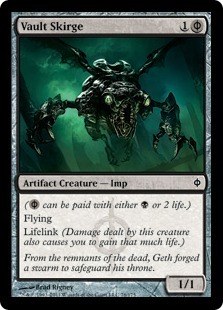 While there are other budget Affinity options available, like the Tempered Steel build we played a few years ago, Artifact Blast Affinity seems like the perfect starting point for Modern if you like attacking with cheap artifact creatures and closing out the game quickly, with the added benefit of an upgrade path to a legitimate tier deck in Affinity proper. At $68 in paper and 10 tix on Magic Online, Artifact Blast Affinity is already pretty cheap, even by Modern budget deck standards. This being said, if you want to make the deck even cheaper, the easiest cut is Blinkmoth Nexus, which would drop the total deck price down near $40 in paper. While the creatureland is a nice hedge against sweepers and a good way to poke through some extra evasive damage, it wouldn't kill the deck to replace Blinkmoth Nexus with more Mountains or a cheaper colorless land like Zhalfirin Void or Ghost Quarter. Otherwise, there's not a whole lot you can do to make the deck cheaper, since all of the other cards in the deck are already less than $1 per copy. 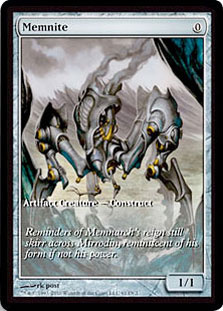 For our non-budget list this week, we have normal Affinity, a deck that has been near the top of the Modern format ever since its creation. The good news is that many of the cards we have in our budget deck have a home in the tier build. The downside is that there's a handful of really expensive cards like Mox Opal and Arcbound Ravager that make upgrading an expensive process. How much better is the non-budget Affinity list than Artifact Blast Affinity? That's a tough question to answer. The biggest advantages of the upgraded build are that Mox Opal speeds up the deck significantly, by close to an entire turn, and Arcbound Ravager is a great finisher. It also gets another creatureland in Inkmoth Nexus, which is a nice backup plan for closing out the game with Cranial Plating. These little advantages add up over the course of a big tournament, but if you're just playing at FNM or on the kitchen table, I probably wouldn't bother spending the amount of money it would take to upgrade to tier Affinity.